We work towards influencing, national, regional and global development agendas so that they can address the urgent economic, financial, environmental crisis adversely affecting the women of Asia Pacific. APWLD also works with other movements to advance Development Justice – a framework that seeks to reduce inequalities of wealth, power and resources, between countries, between rich and poor and between men and women. The United Nations Agenda 2030/Sustainable Development Goals came into effect in 2015 and commit nations to address a broad range of social, economic and environmental issues for the next 15 years. However, these goals fail to challenge the growth-focused, extractivist model of development and lack the commitment that will shift inequalities of wealth, power and resources and accountability that bind governments to meet their human rights obligations. The agenda itself has been been influenced by corporations, undermining any accountability that governments may have towards people. We have been working to increase the capacity of women’s movements to effectively engage in and understand the development justice agenda including Agenda 2030 Sustainable Development Goal. We have supported monitoring and review of the SDG implementation at national level for use as advocacy material at regional and global levels. Our members have also been actively participating in the ministerial and civil society processes of the Asia Pacific Forum on Sustainable Development. 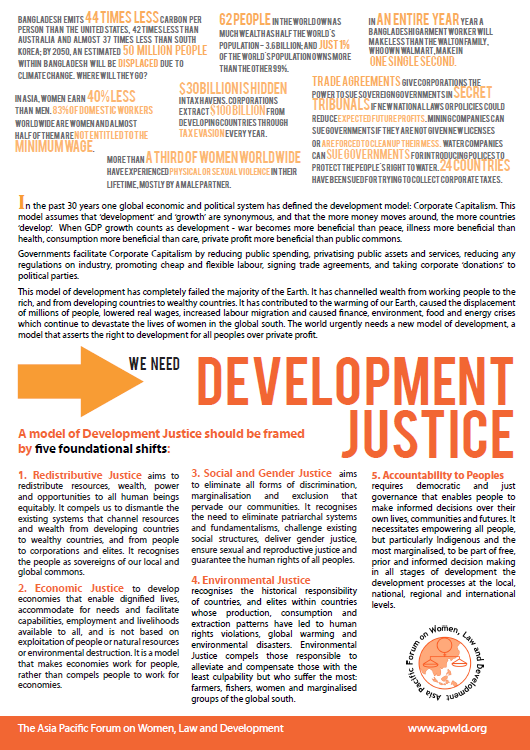 Further, we have produced resources, tools and advocacy materials for campaigning on Development Justice. Our Road to Development Justice Video has been widely shared and viewed among partners and networks and serves as an illustrative introduction on the double crisis of increasing inequality and planetary destruction.